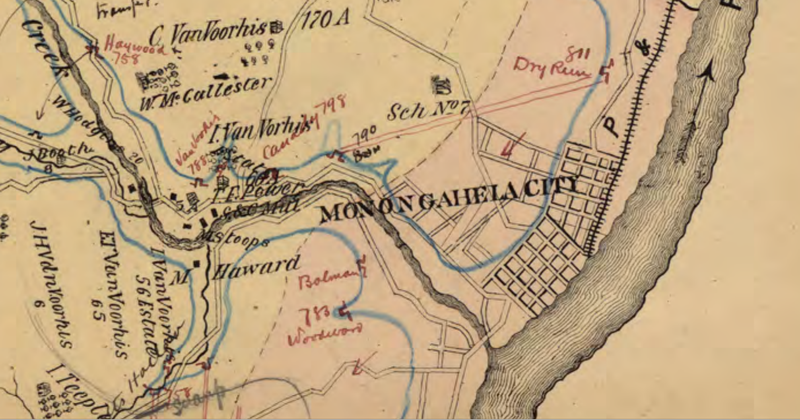 A detail of Caldwell’s Atlas of 1876 from Rootsweb. Key for a Sanborn Insurance map. *edit* March 9, 2016 – sorry for the delay. I’ll have a new post about using Sanborn Insurance maps up sometime this week. Congratulations, Dan!! Love your blog and definitely don’t have enough free time to explore and read everything, but please, keep up the good work!! Thanks Judy! I love getting comments. It assures me people still visit! Love your blog. But a bit jealous that your town’s paper got digitized. Still trying to figure out if it’s possible for mine. 🙂 Looking fwd to your Sanborn post. Hi Tammy and thanks for your comment. I’m trying to find out the same thing in a way. The Monongahela library has microfilm of our newspaper going back to the 1850’s I believe but I don’t know why the older issues haven’t been digitized. Hope to find out how to get it done some day. Thanks for your blog, Dan. I now live in Upstate NY, Rome, and love reading your stories about MonCity. Happy Birthday! Thanks for all that you do. Love the page!